Spend your phone's last minutes with people who understand your sentiment. There are times when our phones just die on our faces. It is especially upsetting when you’re in the middle of an important chat. 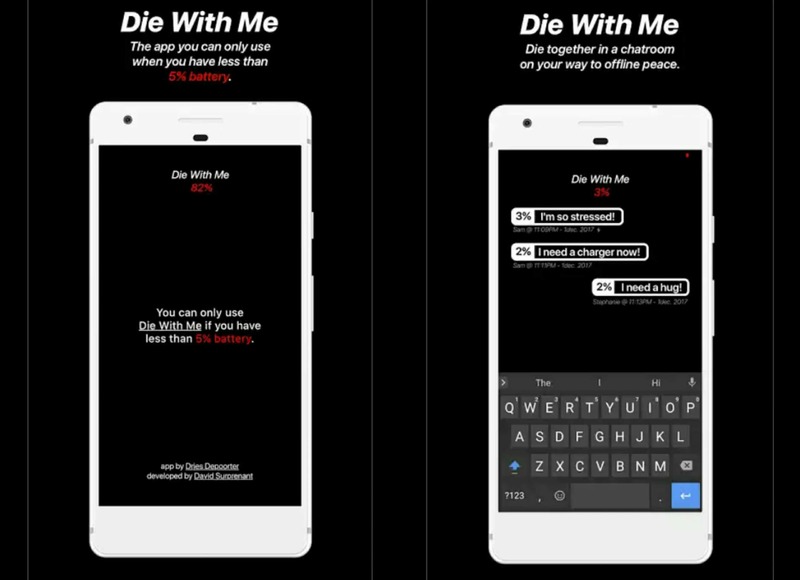 But just in case you haven’t experienced this perturbing scenario (probably you live a boring chatless life, or maybe you’re always wired on an outlet), then there’s one app we can recommend for you to try. 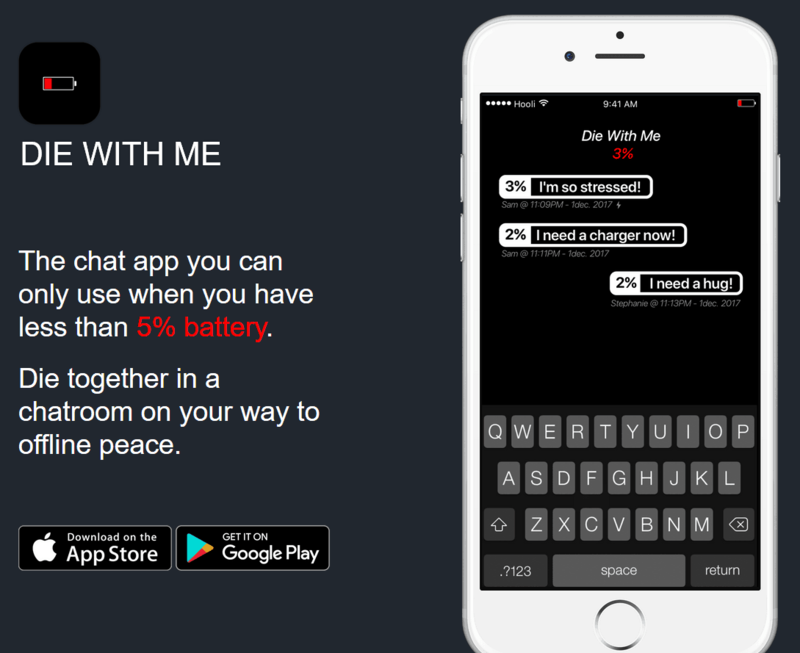 Insert “Die With Me“, a chat service you can’t use unless your battery is less than 5%. Once the app detected that you’re below the mark, you’ll have access to a chat room consisting of people that are also having the same issue. The fun part is that everyone knows your battery percentage. 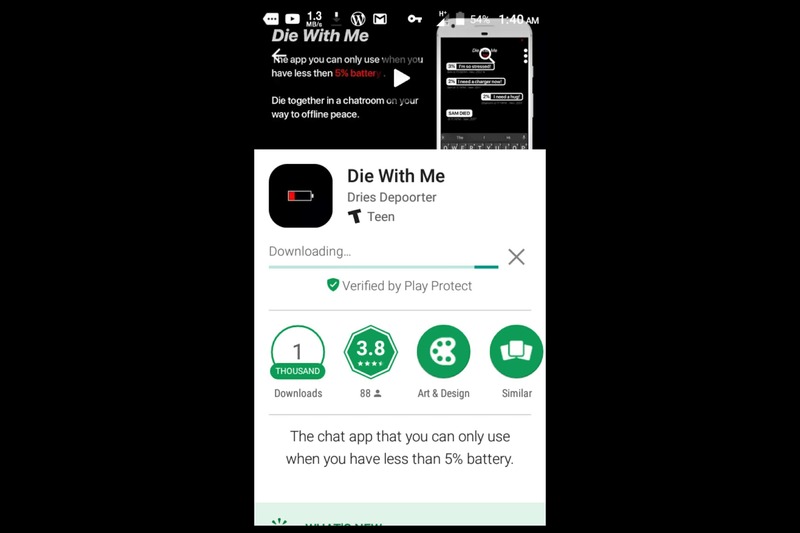 If your phone dies, there’s no more explaining. By the way, everyone in the chatroom is random people. It’s not some sort of a “Tinder” thing. No romance, no commitment. You don’t have to explain anything to anyone. However, I wouldn’t advise this app to people that are easily get attached (people like me, seriously). I was in the middle of a chat room when some random guy asked “How’s the weather in your area?”. I found the question super interesting, taking into account that probably most of us are living on the other sides of the world. Everyone responds like “lol. It’s snowing in here” or “Raining over here” and all that stuff. A minute later and I started to feel the attachment between us users. Some died in midst of the conversation, whilst others started offering their Facebook names so we can all continue chatting there—yes, creepy I know. While enjoying reading the replies, I lose track of my battery percentage and suddenly my phone died. I literally freaked out in madness. I did not even get a single name of my new “4 minutes” friends. It reminds me of the song “You’re Beautiful” by James Blunt—minus the romance. For me, it’s a sort of “psychological trauma” and I’m in no way trying the app, ever again. I don’t know if everyone’s having the same issue, maybe it’s just me? 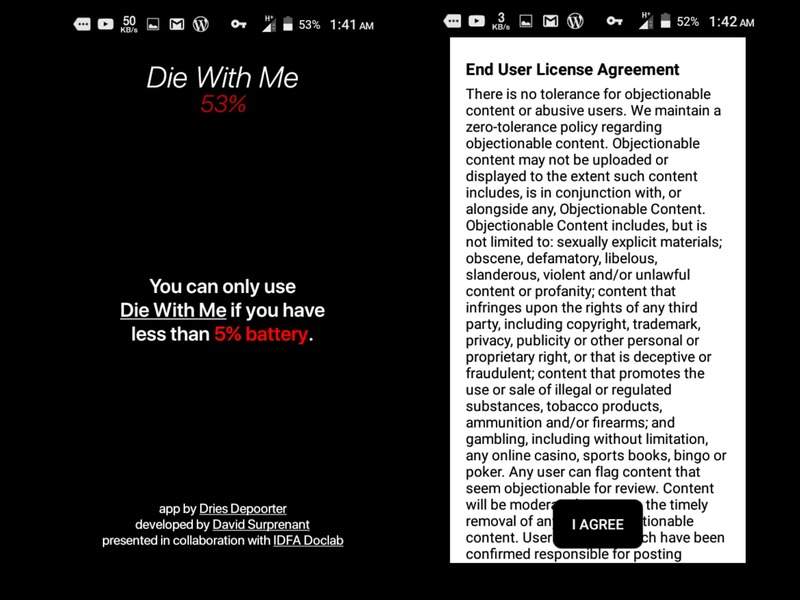 The “Die With Me” app is available for both iOS and Android. If you have some extra bucks, $0.99 to be exact, this is something that you should definitely give a try—of course, except for people like me. I will leave the app boxes on both platforms below. Note: The app isn’t perfect for now. You may occasionally experience some freezing or crashes along the way. This is due to the influx of users using the service. Hopefully, the developer could sort this out soon.